Tihana Ela Kružić graduated from the Faculty of Political Science, University of Zagreb. 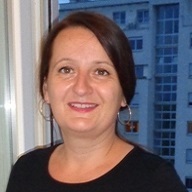 Currently, she is holding the position of the Head of Media Analysis Department at Press clipping in Zagreb. Together with her team of experts, she is dedicated to the development of efficient methodologies for media analysis and PR evaluation, as well as pinpointing the importance of the overall evaluation process. The quest for the best measure is a mission she and her team took very seriously. Clients she works with are coming both from the private and public sector. Occasionally she is a guest lecturer at Zagreb School of Economics and Management and her work was published as an integral part of one scientific study in Edward Bernays conference proceedings 2015. Before full commitment to analytics, she served as an Assistant Director at Press clipping. Love and interest for the media came a long time ago while she was working with the National Democratic Institute for International Affairs on the development of democratic institutions, political programs, political communication and freedom of the media. On her free time, she works as a Tour guide for the City of Zagreb and Zagreb County.